Metacomet Lake is one of my favorite fishing spots. It was the first place I broke 4lbs and the first place I broke 5lbs so it holds a special spot in my fishing history. I used to go here all the time when I was in grad school in Amherst and like to make a trip back once or twice a year. You definitely need a boat as there practically no shore access. I love taking my little sun dolphin out there because it gets really shallow on the eastern shoreline and we fish in about 1-2 feet of water. For boat access, there is a public ramp and parking off of Poole Road. I typically fish the eastern shoreline pretty much the whole time when I'm there as it is covered with lily pads (which I love fishing) and bushes that run about 5 feet into the water. It's a great place to cast right next to the bushes and pull out tons of bass. There is a little cove that is about 2 feet deep the whole way in (about 100 feet) that is loaded with fish early in the season. As it gets hotter, they go a little deeper, just on the edge of the cove. I spent about 9 hours out on the lake one day and went around the entire shoreline of the lake twice. I caught fish on the southern, eastern, and western shores. The northern shore was clear of any weeds or lilly pads and was very hard to fish. There are a couple docks you can work as well that I would've put more time into had the other parts of the lake not been producing. The lake gets pretty deep in the middle, which is where I assume the fish headed after the spawn period. If I was to attack the middle, I'd go in with a deep diving crank bait or a lipless crank bait and burn it over the top of them. As I update this, I'm actually planning in trip out there 3 days from now so hoping all of this info still holds. We'll see! Boat Access? Yes, off Poole Road. Yes, I live in Belchertown and this is a great place to fish for largemouth bass. Better yet, this is definitely my favorite spot to fish for BIG bass. It's a relatively small lake, but the majority of fisherman around here practice catch and release. I know of people who have removed 8 and 9 pound bass from this lake though, sadly. I know numerous people who land multiple 5-8 pound bass here every season, myself included. I have a gut feeling that there are a couple of 10 pounders swimming around in this lake. One night at about midnight something vacuum sucked a 10" power worm off the surface with more force than I have ever seen. Never have I heard such a deep-toned surface gulp. The lake is stocked with rainbow and tiger trout fingerlings; this supreme forage in a lake with an abundance of aquatic vegetation (at times too much, the lake is usually treated with algaecide bi-annually) coupled with the good sportsmanship of catch and release fishermen is what I believe to be the driving factors behind the plentiful trophy bass here. I have had a lot of luck here with topwater frogs. In fact, all of my 4+ pounders here this season have been on a Live Target hollow bodied frog. Rubber worms never fail to produce as well as standard go-to baits such as Rapala broken-back minnows, crankbaits, buzzbaits, and rooster tails. 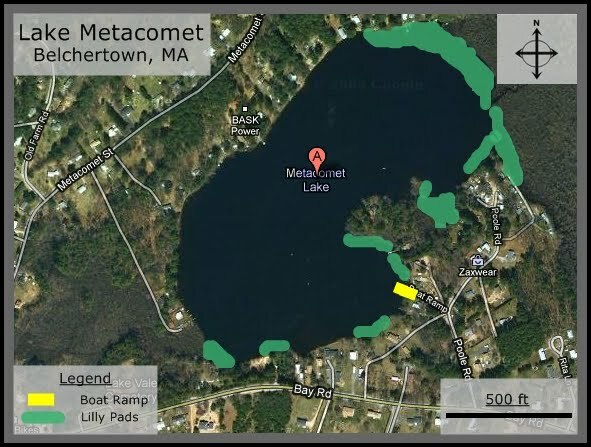 Have fun catching seriously big bass at Lake Metacomet, but please have some respect for these amazing fish as well as your fellow anglers and return the fish after you have taken your measurements and pictures. I have not run into the big fish here as other people have stated. Being a heavy cover fisherman at heart (frogs, flippin, etc.) this lake got me very excited. Although i have caught many decent sized bass, i have caught way to many pickeral for my liking. I will continue to come back and try to find some lunkers, but the pickeral abundance is a real nuisance to me and is a definite downside to the lake. You are doing a great job on web site. I really enjoy.